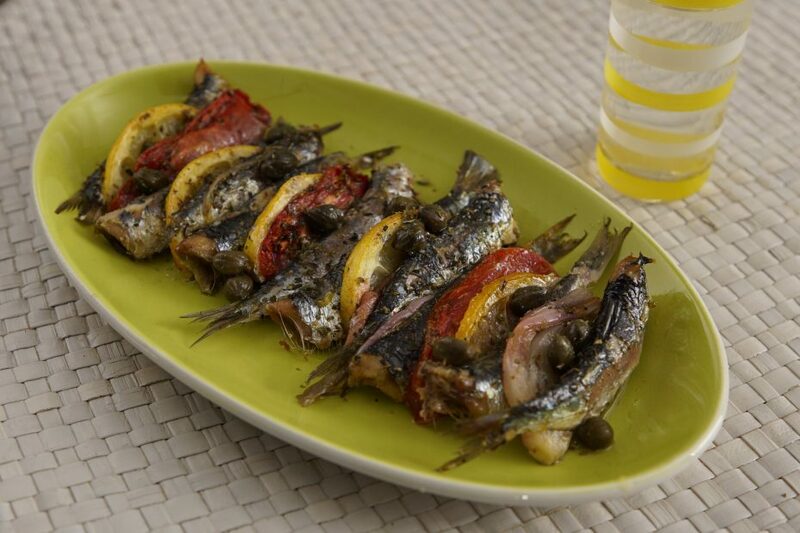 Sardines, packed with omega fatty 3 acids and antioxidants, are a favorite fish in Greece. We eat them grilled, fried and baked. 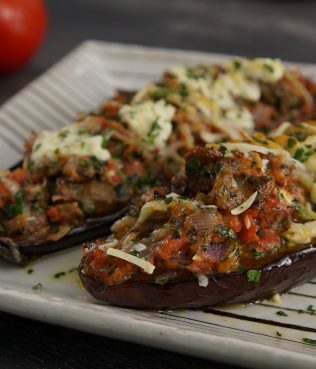 This recipe, from Season 1 of My Greek Table, is inspired by the flavors of Lesvos. To find some of the artisinal Greek products you'll need to make this, visit my online shop here, where you'll discover a host of lovingly curated Greek ingredients. Clean the sardines: Using a sharp paring knife, cut off their heads from the spine toward the belly and pull down gently to remove the attached viscera. Run under cold water and scoop out any remaining viscera with a small spoon or your fingers. You can wear gloves while doing this as sardines have a strong, lingering fish smell thanks to all the healthy oils they contain. Rinse the sardines well in a colander. Lightly oil a rectangular ovenproof glass or ceramic baking dish. Place the sardines inside the dish one by one in neat rows alternating the placement of each so that the first one sits plump end to tail, the second one snuggled next to it tail to plump end, etc., thus enabling the most ergonomic use of the space in the pan. Take the tomato, onion and lemon slices and snuggle them between the fish alternating between each as much as possible. Sprinkle the capers over the fish evenly. In a small bowl, whisk together the lemon juice, ouzo, mustard, and olive oil. Pour the mixture evenly over the contents of the baking dish. Season with salt and pepper to taste and bake, covered with parchment or wax paper and aluminum foil, for 20 minutes. Remove the paper and foil and continue roasting another 7 to 10 minutes, until lightly browned on top. Serve immediately.